I love this time of year. I love fall. I love Thanksgiving and being with family and friends. I love Christmas lights, decorating my tree, admiring my nativity scene and the semblance behind it. What can I say? I just love this time of year. But if I'm honest, there's also a downside to all of this. The side where you're gone for 3 or 4 days, enjoying turkey and ham, sweet potatoes, pecan pie and the like. The side where you're enjoying your family and friends, getting an adrenaline rush from all your Black Friday shopping deals. And then... well, then it's back to reality. The reality that Aunt Sarah isn't around anymore to wrestle and play with the kids while you have a moment of rest. That Mamaw, Papa, Grandma, and Papa Packy aren't here to help corral and monitor, play and read, and give horsey rides. When you come home to mounds of laundry, bills to pay, presents to wrap, sheets to change, meetings, appointments, and the everyday normalcy and stresses of life. Days where your 3 year old's attitude could rival that of a hormonal 16 year old school girl. Days when you wonder if there is ever going to be a Sunday that Anna doesn't forget her Cubbies book that you just handed her and us have to turn around to go back and get it. 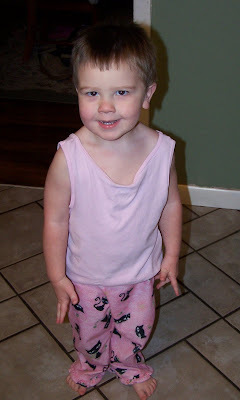 Days where you turn around and find your son dressed in his sister's pink kitty cat pajamas saying, "Look Mommy! Jammies. MINE!" Days where it seems like the laundry and the dishes will never end and like you'll never get back on any form of a schedule. Days where arguments abound, disobedience is rampant, and days when I sit back and wonder how two toddlers could make their rooms look like a natural disaster just hit our house. There are just days like this. But within each of those days are blessings tucked in so deeply that failing to see them as such is near impossible. Days where Anna runs up to me, gives me a big hug and says "I missed you Mommy. You're the bestest." Days where Eli learns new words and gives me his sly little smile when he knows he's done something wrong. Days where Anna wants Mommy to tuck her into bed and when they both want to be rocked and sung to. Days when Anna says the cutest little prayers and recites her Cubbies memory verses. Days when Eli's Puggles teachers tell me he's such a good little boy and is always so well behaved. Days when despite having to discipline and instruct 1000 times over, that I can hold my kids and look into their precious little faces and know that I am truly blessed beyond measure. And for that, I am thankful.